Banff superior accommodations are plentiful, so all you really have to do is decide what you desire in a guestroom and hotel amenities. A spa treatment after your hike perhaps? 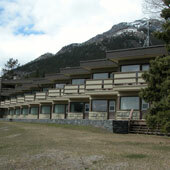 The Aspen Lodge features 89 rooms with satellite TV, clock radio and a coffee maker. Enjoy their Rocky Mountain Continental Breakfast including delicious baking with your stay! Hotel amenities include a large outdoor hot tub, sauna and steam room. Gift shop and free parking available. For a fee guests can take advantage of wirelesss internet, a public internet kiosk, and laundry facilities. 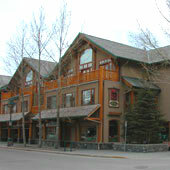 The Banff Caribou Lodge features 195 rooms in various layouts including standard, superior, deluxe loft suites and jacuzzi loft suites. Room amenities include hairdryers, cable TV, coffee/tea maker with complimentary tea and coffee. 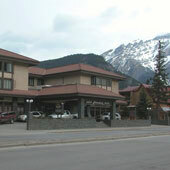 Hotel facilities include high-speed internet access, exercise room, large hot tub and steam room. Complimentary evening shuttle service to downtown as well as free underground parking offered to guests. Red Earth Spa and Keg Steakhouse & Bar are on site. 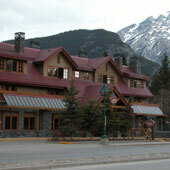 The Banff International Hotel features 165 deluxe, premium and superior rooms to choose from. Room amenities include ceiling fans, opening windows, satellite TV with pay-per-view movies, NintendoTM, marble bathroom vanities, hairdryers, coffee/tea makers, electronic key cards, voice mail, iron and ironing board. 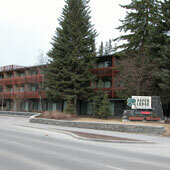 Hotel amenities include dry cedar sauna, steam room, fitness & exercise room, and whirlpool. 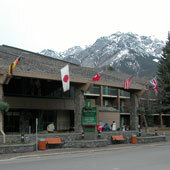 "International Boutique" and “Mountain Grill” restaurant on site. 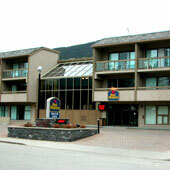 The hotel is wheelchair accessible throughout and provides complimentary underground heated parking. The Banff Park Lodge offers 192 superior rooms, 8 deluxe jacuzzi rooms, 3 executive suites, 6 lodge suites and 2 parlour suites to choose from. Guestrooms feature full bath and shower as well as private balcony or patio access. Room amenities include coffee/tea makers, cable TV with pay-per-view movies, Wi-Fi and optional wired high speed Internet access, hair dryer, iron & ironing board, climate control and in room safe. Hotel amenities include indoor saltwater pool, steam room and jacuzzi. Indoor parking as well as fine dining and family restaurants and lounge are also available. If you are looking for meeting and conference spaces, this hotel will meet all of your needs. Siding 29, a reflection back to the original Siding 29 of the railway in Banff, features a variety of guestrooms all the way from single and standard rooms to Jacuzzi-kitchen suites and presidential suites. Standard rooms include hairdryer, iron and ironing boards, coffee maker and cable TV. Hotel amenities include indoor swimming pool, whirlpool, heated underground parking, and a complimentary continental breakfast. Come and discover the history of the Brewster Family here in the mountains by stay ing at Brewster's Mountain Lodge. This cozy lodge features 60 guestrooms and 17 deluxe suites with complimentary continental breakfast. Hotel amenities include complimentary wireless internet, heated underground parking, whirlpool as well as sauna and exercise equipment. Meeting facilities available. Restaurant Cafe Soleil on site. 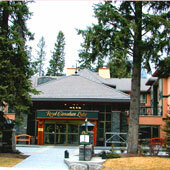 The Royal Canadian offers premier, deluxe and one-bedroom suites. Room amenities include, cable TV, mini-fridge, tea/coffee maker, nintendo, hairdryer, daily newspaper, high speed internet, air conditioner Pay Per View movies, terry robes, in-room safe, iron and ironing board. 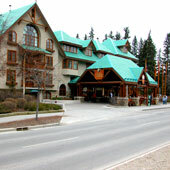 The Evergreen Restaurant is well-known for contemporary Canadian cuisine and fine wines. The Juniper Hotel is located right at the base of Mount Norquay, just outside of the Banff townsite to give you that true mountain experience. The Juniper offers guests 52 rooms, from two two-bedroom wood chalets to luxury suites and even a three bedroom penthouse. Every guest here can enjoy mountain views! Room amenities include 300 thread count linens, micro fibre duvet bedding, terry bathrobes, mini-fridge, CD player, DVD player, on command movies, iron and ironing board, hairdryer, coffee/tea makers. Hotel amenities inlude spa service and complimentary high speed wireless internet. Enjoy dining at the Muk a Muk Bistro & Lounge on site. This hotel also has pet friendly rooms located on the first floor for $25/pet/day. There is no additional charge for CNIB dogs. Pet amenities include pet treats, clean-up bags, pet beds, water/food bowls. 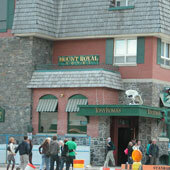 Situated on Banff Avenue, the Mount Royal Hotel offers 135 rooms, from standard to superior, junior or deluxe suites. Hotel Amenities include sauna and indoor whirlpool and you are just steps away from Tony Roma’s Restaurant and Lounge as well as the Paddock Bar & Grille.